Perfect for any occasion, these Overnight Refrigerator Rolls can be made ahead and chilled in the fridge until the day of serving. They’re soft, fluffy, absolutely irresistible, and are perfect for anything from holidays to Sunday dinners. If you know me, you know Thanksgiving is my favorite holiday. It’s a time for family, making memories, and delicious food. SO much food. Let’s be honest, it’s what everyone looks forward to, me included! But all of that cooking on one day can be overwhelming, especially when family and friends are coming to visit. I don’t like spending all of my time in the kitchen, so I plan ahead and try to make recipes ahead when hosting dinner. These Overnight Refrigerator Rolls are here to save the day! They’re easy to make ahead, bake the day of, and even easier to eat. Sometimes, make-ahead means a compromise in flavor or quality, but not so with this roll. 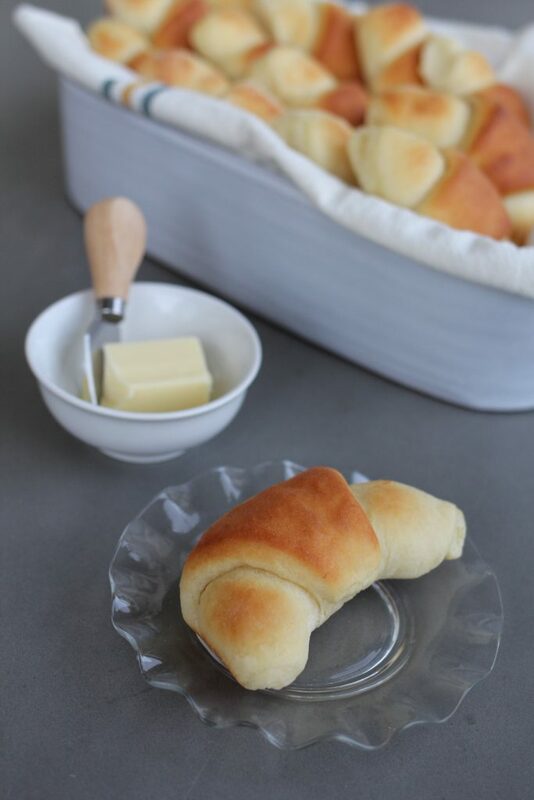 It is one of the best roll recipes, ever! 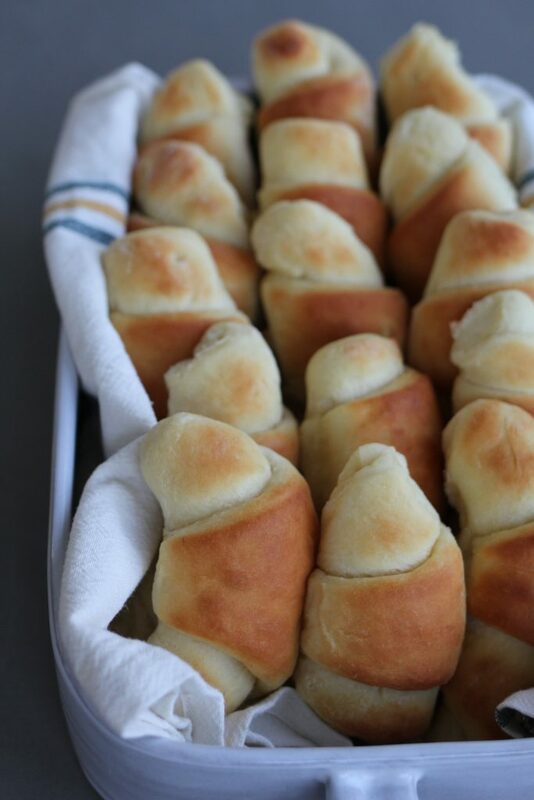 Rolls are essential to any holiday meal. That warm, fluffy texture and buttery flavor go perfectly with anything, from jams and jellies to turkey and gravy. Overnight Refrigerator Rolls are my go-to for weekend and holiday gatherings. 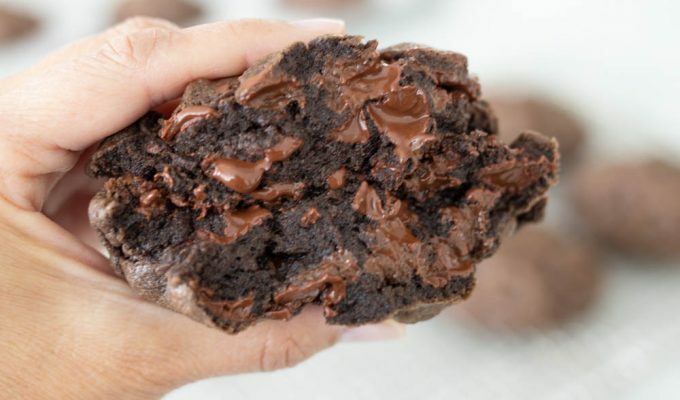 One less thing to prepare, and melt in your mouth delicious. I’m a happy camper. That’s why I know you’ll love this recipe too. And trust me, your family and friends won’t be able to get enough of these. Lion House Rolls, Maddox Ranch Rolls, and My Mother-in-Law’s Rolls. Because everything tastes better homemade. And everything tastes better when you’re surrounded by loved ones. 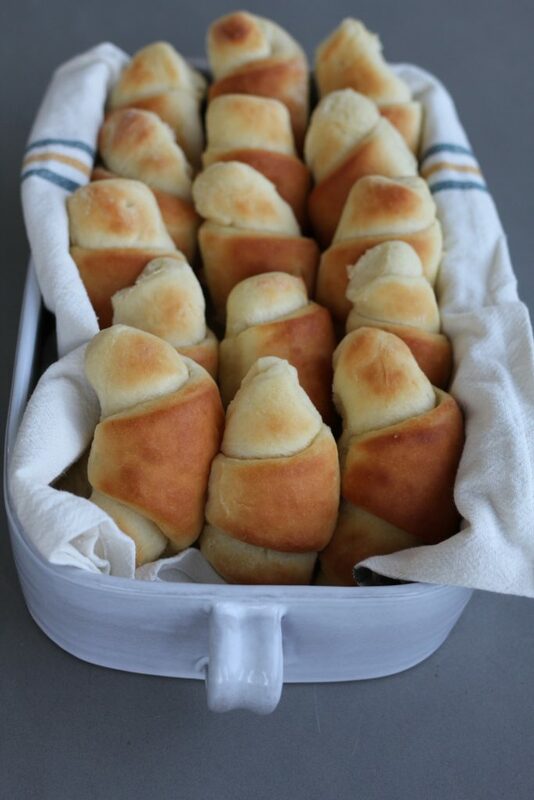 Overnight Rolls can be made ahead and chilled in the fridge until the day of serving. 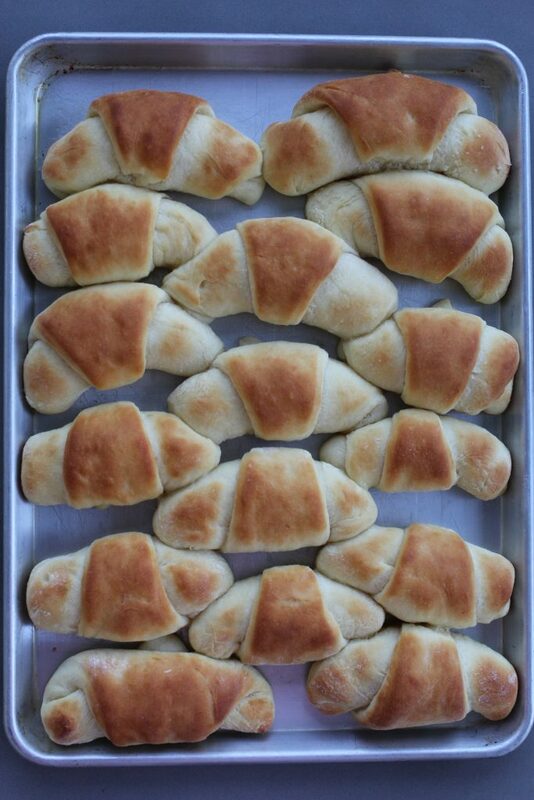 Soft, fluffy, absolutely irresistible rolls that melt in your mouth! Sprinkle yeast and sugar over 1/4 cup of warm water. Let stand for 10 minutes or until foamy. Beat eggs and melted butter into 1 cup of warm water in a large bowl, or the bowl of a stand mixer. The butter may separate a bit, this is not a problem. Add yeast mixture to egg the mixture. Add 4 cups flour, 1/4 cup sugar and 2 teaspoons salt to the liquid mixture in large bowl. Mix with the paddle attachment or a large wood spoon or spatula. Add 1/4 cup remaining flour to make soft dough if needed*. Cover with plastic wrap tightly and refrigerate overnight. Three hours before baking, remove dough from fridge, and split dough in half. Roll each half into a 12 inch circle, one at a time. 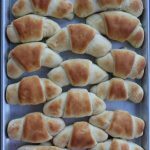 Spread melted butter over rolled out dough, and cut each circle into 8 even pieces per circle. Starting with large end, roll up and set on a lightly greased jelly roll pan or 2- 9x13 pans. Repeat with remaining half of dough. Cover with light cloth and let rise for 2 hours in a warm place*. Bake at 375 in oven for 12 to 15 minutes. The water for softening yeast and the water added to the eggs should be warm, but not hot. The water should be about the same temperature as you would use to bathe a baby! I use all purpose flour for this recipe. Th flour should be at room temperature. If you store your flour in the fridge or another cool place, let it come to room temperature before using in this recipe. The amount of flour added will depend largely upon the climate (dry or humid) the size of the eggs, the temperature overall of the wet ingredients when added to the dry ingredients in bowl. Start with 4 cups and add more if needed. The dough should be slightly stick, but not wet. A "warm place" is an area in the kitchen free of drafts. The kitchen temperature should be at least 70-72 degrees. Do not set the rolls directly on a counter top made of stone, always use a cloth underneath so the pan will not get chilled from the stone surface. This recipe may also be made with out refrigerating overnight. Simple make dough, let rise in bowl for 1 hour in warm place, covered. Then roll out, let rise for about 45 minutes to 1 hour, and bake as directed. Yes, Sandy, it can be doubled, or you could make two batches. Thanks for asking and for reading ABK! After rolling out the dough, no instructions about cutting it into pieces that roll up. No eggs noted in the ingredient list! Is it 2 large eggs? PS – I love love love your recipes and have made many of them. Thanks for sharing! And I love your tips that go along with the recipes! I’m going to give this recipe a try as well. Oh wait – so sorry – you DO list eggs in the ingredient list!!! I love you site, recipes, and tips. Thank you so much for your goodness. You’re very welcome, Judy. Thanks for your comment and for reading ABK! Making these today (prepped yesterday!) as I host my in laws for Thanksgiving! First time doing everything solo and finally feel like a grown up at 27;) Thanks for all the recipes on our menu! That’s no small accomplishment!! Glad you were able to use some of the recipes on ABK! How do you keep your ends from popping away from the toll when they cook? Mine always spread away like they want to unravel…??? Hi Jess, Make sure to tuck the end of the roll UNDER when forming. This helps with the roll not unraveling. If it does during the rising process, just carefully pick up the roll and place the end under, gently place back on cookies sheet. Thanks for reading ABK!